Yaroslav Brovin has released a new version of his native progress dialog components with support for Delphi XE6 Firemonkey on Android and IOS. XE5 and AppMethod support is unknown but you can probably modify it to work on those previous versions as an older version of these components was originally for XE5. 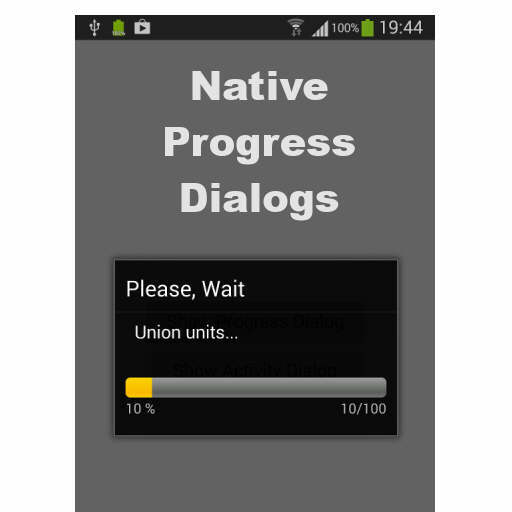 The first component in the pack is called TfgProgressDialog and it implements a dialog that is native to Android and IOS which you can call that will show a progress bar while you do the work in the background. There is also TfgActivityDialog which is similar to the progress dialog but it just has a rotating icon instead of a progress bar. There is TfgActionSheet which appears to dynamically create a native dialog menu popup for a list of Actions. There is TfgColorsPanel which is a panel that contains a bunch of colors and acts as a color chooser. Lastly it also includes a component called TfgLinkedLabel that implements an underlined look of a clickable web URL and click events to launch that URL in the device browser. These components are free but the page is in Russian so I have run it through Google Translate for you. Head over and check out the full post with screenshots of the free native dialog components for Delphi XE6. Update: Here is a patched version of the native dialog components for Delphi XE7 Firemonkey. An official version from Yaroslav Brovin is suppose to come out soon. Can you please share the same for XE7 version. I have made some changes to work in XE7 also. But it is not working properly. I mean it is not hiding the dialog in some caes. I patched my version to make it work. I haven’t seen any problems with it so far. An official version is suppose to come out soon.